” . . . many people in my community are asking are no longer about the protection of children or the abuse itself (though it is still an important topic). They are asking questions about church leadership, clericalism, power structures, and the role of the laity.” These are the topics of our assembly. Please join us! 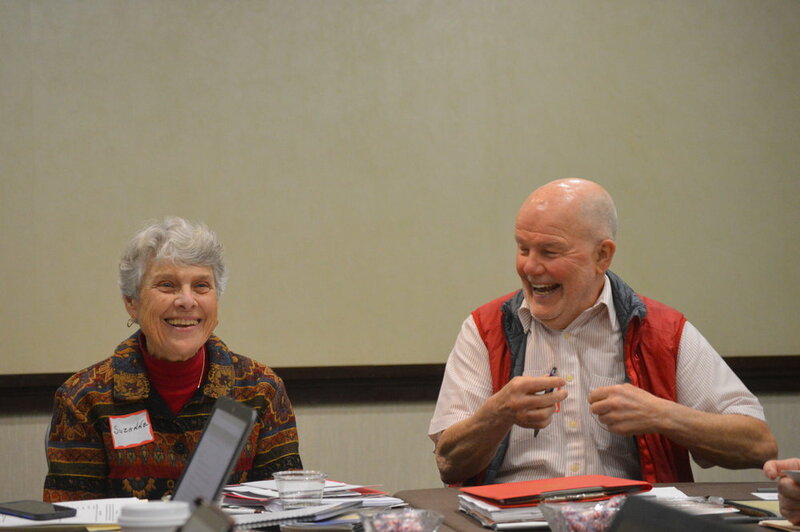 Sister Suzanne Giblin, CSJ, and Father Bernard Bob” Bonnot enjoy a light moment during the planning retreat for the St. Louis Assembly. Sister Suzanne will help Assembly participants experience a contemplative dimension following keynote addresses. BLASE CUPICH Then-Archbishop Blase Cupich welcomed AUSCP members to Chicago for the June 2016 Assembly. He will give keynote in St. Louis in June 2019. Cupich is the voice of the pope in the United States. Blase Joseph Cupich was born in Omaha, Nebraska into a family of Croatian descent. He attended St. John Vianney Seminary at the University of St. Thomas in Saint Paul, Minnesota; the Pontifical North American College and Gregorian University in Rome; and Catholic University of America in Washington, D.C. He was appointed the Bishop of Rapid City, South Dakota, in 1998; Bishop of Spokane in 2010; Archbishop of Chicago in 2014; and was elevated to the College of Cardinals in 2016 by Pope Francis. GAILLARDETZ Richard Gaillardetz was a keynote speaker at the first Assembly of the AUSCP, held at St. Leo University in Florida, in 2012. He is an American theologian specializing in questions relating to Catholic ecclesiology and the structures of authority in the Roman Catholic Church. For his dissertation he researched the Theology of the Ordinary Universal Magisterium of Bishops. WATCH an interview with Richard Gaillardetz from Boston College Libraries, March 9, 2018. PIMENTEL Sister Norma Pimentel is executive director of Catholic Charities of the Rio Grande Valley. ROSICA Father Thomas Rosica was a keynote speaker at the 2015 Assembly of the AUSCP in St. Louis. Following the announcement on February 11, 2013 of Pope Benedict XVI’s resignation, Fr. Rosica was invited by the Vatican to join the staff of the Holy See Press Office and serve as one of the official spokespersons for the transition in the papacy that included the resignation, Sede Vacante, Conclave and election of the new Pope. Fr. Rosica assisted the Vatican during a critical period in Church history. At the end of the Papal transition in April 2013, the Vatican asked him to serve as English language assistant to the Holy See Press Office. From 2013 to the end of 2016, he served in this capacity on behalf of the Holy See Press Office. Leadership Team members, meeting in St. Louis to prepare for June Assembly: Peter Daly, Archdiocese of Washington, DD; Greg Barras, Diocese of Biloxi; Tulio Ramirez, MXY, New York; Sister Jackie Doepker, executive secretary; Lee Bacchi, Diocese of Joliet; Kevin Clinton, Archdiocese of St. Paul-Minneapolis; Bill Spilly, Diocese of Rochester; Louis Arceneaux, CM, New Orleans; Aidan McAleenan, Diocese of Oakland; Bob Bonnot, Diocese of Youngstown. Not present: Michael Bausch, Diocese of Rochester; Jim Kiesel, Archdiocese of Baltimore; Clarence Williams, CPPS, National Black Catholic Clergy Conference.